Exactly what am I offering? Enlightenment, energy, experience, teaching or relationship? Many assume, few actually know. This free meeting aims to make it clearer, not by telling, but by showing. Seeing is believing. Your experience is your guide. So open you senses and notice everything that happens. 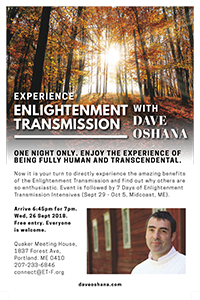 Silent Enlightenment Transmission online event. Completely free. First come, first served. Apply early. Would you like to be transported to heaven and have your feet on the ground at the same time? Saving Humanity: Is Enlightenment Transmission Essential?